Bring Your Dog to These AWESOME Breweries & Wineries! San Mateo County/Silicon Valley is home to many dog-friendly breweries and wineries. We&apos;ve listed some of those here to help you learn more about these great venues and inspire you to plan a visit soon! 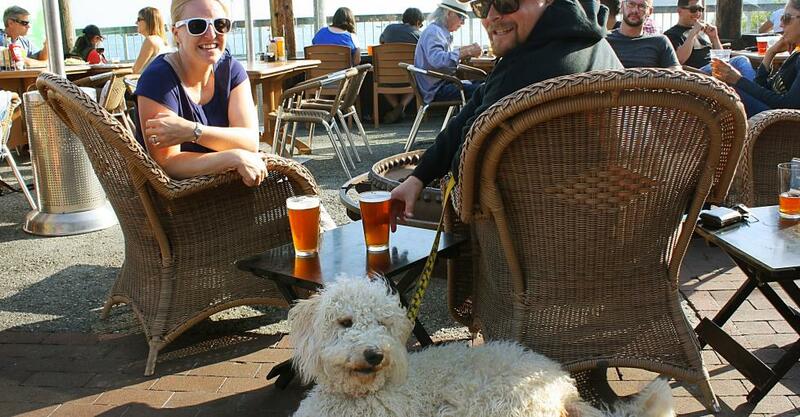 This local pub is one of the best places to grab a cold beer with your furry friend. Freewheel Brewing Co. is super dog-friendly and dogs are always welcome to accompany you on the outdoor patio. Their staff loves dogs and they provide them with water bowls and treats. The brewery also hosts adoption events with local shelters as well as participating in fundraisers for non-profit pet organizations. If you’re in the area, make sure to visit Freewheel with your pup and drink a pint or two on the patio! Planning on spending a day on the coast and are in need of a cold brew? The Half Moon Bay Brewing Co. is an extremely dog-friendly brewery and restaurant that features a big dog-friendly outdoor patio with a beautiful view of the harbor. The brewery also provides your dog with water bowls, dog treats and their very own dog menu! So, come out and enjoy a nice coastal outing with your BFF. Another awesome, dog-friendly brewery, Pedro Point Brewing is Pacifica’s first and only brewery offering over a dozen beers on tap, all brewed on-site at their locally owned and operated craft brewery. And, to make things even better, pups are always welcome! Dogs are allowed to be with you inside the brewery where water bowls, treats and beds are always available for them. Pedro Point Brewing’s owners are huge dog lovers, supporting many pet-related charities and events throughout the year. Therefore, plan a visit with your doggy and enjoy their cooling fog and sparkling sunshine. Continuing the coastal trend, La Nebbia Winery is one of the best dog-friendly wineries in Half Moon Bay. Pups are allowed to keep you company inside their tasting room while you sip their handcrafted wines. They are also welcome in the patio and picnic area, which are the perfect settings to spend a nice afternoon with your BFF. La Nebbia is open daily from 10am – 5pm, so plan a visit soon to taste some wine or to unwind in the gardens with your family and friends! Moving on to the bayside, Cuvee Wine Cellars has to be on top of your list. This hidden gem is located in the heart of industrial San Carlos and offers a wide variety of magnificent, award-winning wines. Their tasting room is open every Saturday from 1:00pm – 5:00pm and every last Friday of the month from 6:00pm – 9:00pm. Dogs are welcome to join you on the patio with water bowls and treats. Also in San Carlos, Russian Ridge Winery is another local, family-owned, dog-friendly winery that has to be on your list! This relatively small winery makes small lots of 40 to 200 cases of their award-winning wines at a time, so make sure to keep an eye out for their new releases. Their tasting room is open Fridays from 5pm – 9:00pm and Saturday-Sunday from noon – 5pm. Dogs are welcome to join you during your visit and they are provided with treats and water bowls. This beautiful winery is located in the hills of Woodside and offers wonderful views of the San Francisco Bay Area. Thomas Fogarty is the only winery in San Mateo County with vineyards on-site, which provides the ultimate “wine country” feel. Pups are welcome to accompany you outside (on-leash) as you explore their estate. Water bowls and treats are available, as well. Their owners are avid dog lovers, supporting numerous dog-related charities such as Tony LaRussa’s “ARF” program. Photo above courtesy of Half Moon Bay Brewing Co.
For more information on pet-friendly establishments and activities, please visit the pet-friendly section on our website.